How do you quickly pass 5 hours with great artists, tiki drinks, live music and lots of Ohana? 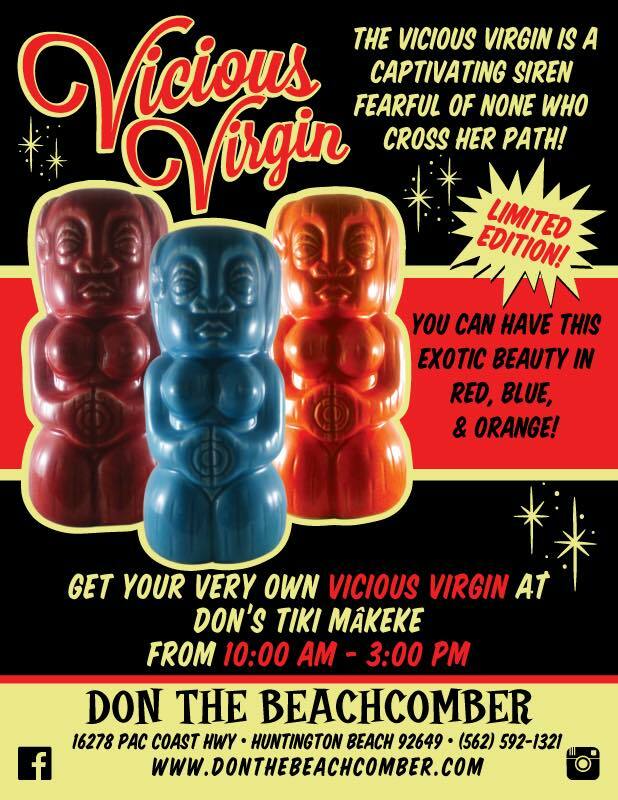 You attend the Tiki Mâkeke at Don the Beachcomber in Huntington Beach. Sunshine and Starshine took the podcast to the event and enjoyed a day with lots of friends and new faces. We have several interviews for you in this episode that will give you some insight into upcoming events, get to know a new spirit or two and great conversation with the artists who make it all happen. Listen to the full episode and use the chapter markers to skip around as well as click the links to visit each vendor or artist. This is as close to being there as you can be without being able to attend. The next Mâkeke is March 11th! Are you feeling lucky? We hope to see you there. Pat of OB Tiki happened to be just across the way from our recording booth at this months Tiki Mâkeke. After eyeing his handy work for a short while we asked Pat to join us and share his tiki carving journey. You will want to listen to the show and hear Pat share a little about his carving style and inspiration for carving. Be sure to check out his page and see his work for yourself. And, a great guy to talk to. Ron (Monster) Monasterio was right next to us at the Mâkeke. Not his first time showing off his very colorful tiki wares and art. Ron is an avid podcast listener like many of you and we chatted for a while about how much we enjoy the tiki art community. Take a look at his site and view not only tiki but art of several genres including photo, video and design work. Jeremy Cross of the Night Gallery in Santa Ana was nice enough to sit at the mic with us and tell us about the upcoming exhibit at the gallery. He may have described the evening as "spooky, tiki drunk". 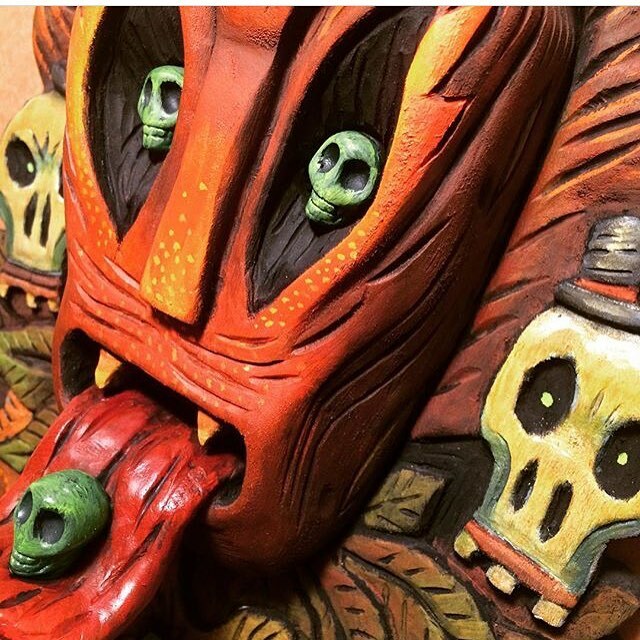 The upcoming exhibit titled Dark & Stormy a Tiki Nightmare sounds like something many a tikiphile would enjoy seeing. The darker side of tiki is revealed in several art forms for your senses to enjoy. February 4th, 7-10pm at the Night Gallery. Live music by Jimmy Psycho, tiki art with the artists and cocktails by Deadhead Rum. The hottest event in May is Tiki Caliente 9. Rory Snyder is the host and creator of this event now in its ninth year and we had the chance to talk to him and get just a tease of what you can expect this May. One particularly BIG pieces of news is that TC9 will now span four days from Thursday to Sunday. Thats more room parties, more bands, more artists and more Ohana all weekend long. Listen to the interview for more. While walking the Mâkeke this time at Don's we noticed Calivore Spirits handing out samples of rum punch. Interested! We took a quick moment to introduce ourselves and talk with Aaron Bergh, President & Commander in Mischief and Sarah Kraft, Sales Manager. Aaron and Sarah walked us through the two Rums and Gin they were offering and the samples of each. Its good to mention that their booth was one of the busiest. Immediately intrigued by these tasty craft liquors, we invited Aaron to join us behind the microphone and tell us all about Calivore Spirits.